An application and a process involving integration of dynamic models for a data-rich environment, incorporating a multi sensor dataset is discussed. The potential utility of such data fusion for different phases of disaster management: vulnerability assessment, early warning systems, disaster mitigation, response, damage assessment and recovery are delineated. Case studies are drawn from disaster scenarios for flooding, drought management, and heavy rains in India. Applicability of the technology and processes, with potentially different sources of data, is described. Solutions to several technological challenges to handle large data sets using distributed cluster technology and data visualization, using high-resolution large display systems, are presented. Taking an example of the July 26, 2005 heavy rain events in Mumbai, India, which caused flooding, and resulted in over 400 deaths and nearly a billion US economic losses, the ability of multiple models to study the predictability, variability and use of model – satellite data fusion for severe weather and disaster mitigation, as well as response needs is discussed. 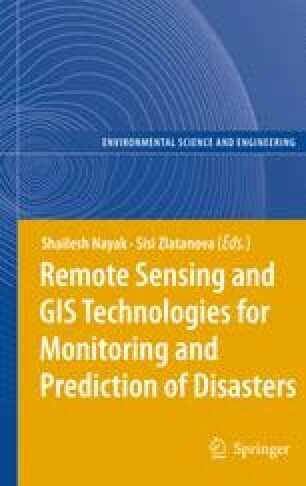 A case for multisensory satellite datasets and the use of upcoming technologies, including handheld computers and cell phones in facilitating early warning, evacuation and emergency intervention is addressed. A case is made for a technological and educational infrastructure development that can benefit from remote sensing centric models with different complexity and a community cyberinfrastructure for multidata access for disaster management.